Homeless campers at Mokuleia Beach Park were busy packing up their possessions yesterday, facing an eviction deadline of 7 p.m. With her tent dismantled and possessions packed, Marie Beltran, holding her granddaughter Kanoe Keawemauhili, pondered the approaching eviction deadline yesterday. Beltran believes her family has a claim to the park area. Hearing no protests from campers, the North Shore Neighborhood Board had voted to close the park at night after the restroom facility was demolished in April. Campers were informed of shelters with available space. Dozens of homeless people and their children, dogs and cats piled into cars, buses and trucks and left Mokuleia Beach Park before police arrived last night. 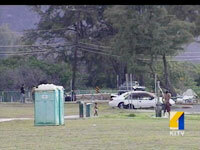 The overnight closure of Mokuleia Beach leaves many of homeless residents scrambling for a place to go. Longtime park resident Marie Beltran, the only one who had planned to remain despite new park rule to close the park daily at 7 p.m., said she would pack up and leave in order to protect her belongings. Beltran's eyes filled with tears as she talked with reporters after police cited her for violating the rule, which went into effect yesterday. Beltran, who had said she would stay because she believes her grandfather has title to the beach park property, hoped to be cited for trespassing and was surprised the citation was for violating the new rule. She had two hours to clear out the remainder of her possessions, and said she would do so for fear they would be removed by the city in the morning. Honolulu police arrived at 7:25 p.m. with the parks detail to enforce the eviction of 10 homeless families who have been living at the park. A city official politely informed the illegal campers shortly after 7 p.m. that the park was closed. Police said they cited only Beltran and her husband with violation of the city ordinance, a petty misdemeanor that requires a court appearance but no mandatory fine. Police Capt. 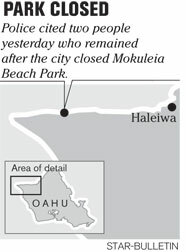 Moana Heu said new signs went up yesterday morning that the park is closed 7 p.m. to 7 a.m., with the exception of fishermen who are allowed to fish along the park's shoreline. A city spokesman said the homeless had been notified of available space at shelters and a pastor who offered to take in those living at the park. The city said the North Shore Neighborhood Board had requested the nightly closure due to health and safety concerns after the demolition of a bathroom in April, which was never rebuilt but replaced with portable toilets. A board member said usually the homeless had been vocal in the past but that no one showed up for the meeting, so the board passed the measure. Andrew Luna, 40, who is disabled because of a spinal surgery and a congenital defect, said the board chairman had promised to inform them of the next meeting but failed to do so. 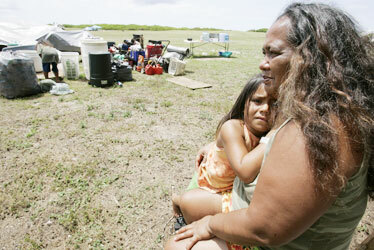 Homeless campers at Mokuleia Beach Park packed up their possessions yesterday to beat an eviction deadline. 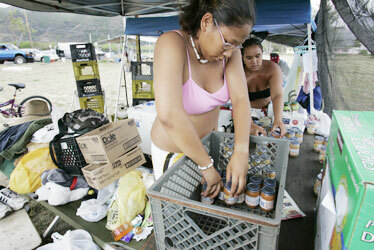 Kanani Kuehu, front left, and Chas Ripa packed baby food in preparation for the eviction. Much of their possessions have been put into a public storage facility. Luna said his supplemental Social Security income of $638 a month is not enough to find a home. He moved from Waianae, where he said drugs are a problem, to Mokuleia where he said he has found a family. "It's really nice to be here," he said. "It's nice to have people you can trust." Many of the homeless worked for days to move their belongings to other locations, including relatives' homes and paid storage, one family spending $600 a month. Frank Smith, 36, who lives at the park with his girlfriend, Mary Jane Dalumpinis, 44, and her son, said, "We are like one big family. We respected each other. ... Breaking up our ohana here is displacing us families."